QUEENSLAND PLEASE SCROLL TO FOLLOW OUR ADVENTURES. FINALLY FOUND OUR FIRST DUCK BILLED PLATYPUS.THIS EGG LAYING MAMMAL WITH A POUCH MAY LOOK FRIENDLY BUT AT THE BACK OF ITS HIND LEG IS A SPUR WHICH LIKE A SNAKE CAN INJECT POISON TO ITS PREY OR LINE OF DEFENCE. Met up at DAINTREE with relations KIETH and ANN FORD of FORDS coaches, the last time we met was at Sheperton two years ago. THIS FELLA TAKES SOME KEEPING UP WITH. LURKING IN THE BEAMS THIS GIANT KOMODO DRAGON IS READY TO POUNCE. STONEHENGE CAME TO AUSTALIA AT GLEN INNES THIS IS CELTIC COUNTRY WHERE ALL THE SCOTS EMIGRATED. EVEN I HAD TROUBLE REMOVING THE SWORD FROM THE STONE. READY TO TAKE FLIGHT THIS CORMORANT WAS CAUGHT IN MIDSTEAM. 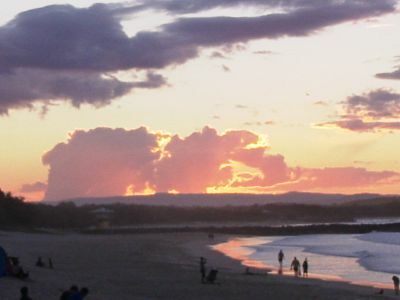 WEDNESDAY 2ND JUNE SAW US AT TWEED HEADS START OF THE GOLD COAST, WITH ITS FIREY BEACHES AND INVITING SEAS. BRISBANE HAS A MIXTURE OF OLD AND NEW. 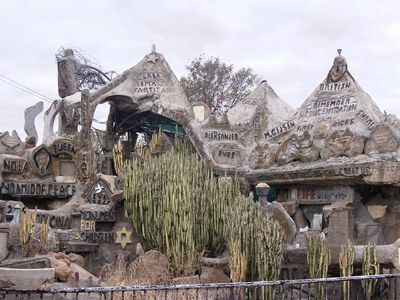 LIKE THIS TEMPLE HIDDEN AWAY DOWN BY THE RIVER A REMANAT OF THE EXPO 88 WHERE COUNTRY'S DISPLAYED THEIR OWN CULTURE. THIS STATUE IN THE CENTRE OF BRISBANE REPRESENTS THE COLONISATION OF THE EARLY SETTLERS IN THIS OVERGROWN AND HOSTILE LAND. SUNDAY 6TH JUNE BRISBANE AT NIGHT COMES ALIVE WITH A HIVE OF ACTIVITY, AMONST ITS GEMS THE STATE MUSEUM HELD AN EXHIBITION OF CHINESE DINOSAUR REACHING HIEGHTS OF OVER 20FEET. 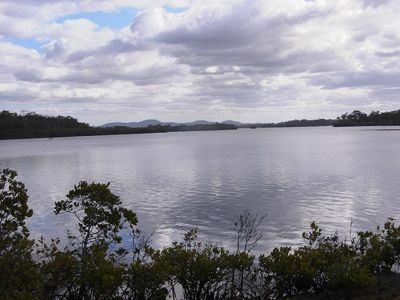 DURING OUR TRIP TO BRISBANE WE PASSED THROUGH BALLINA AND PARADISE POINT ABOVE SURFERS PARADISE WHERE I PURCHASED MY DIDGERIDOO WHICH I'M STILL PRACTISING WITH. Monday 7th. 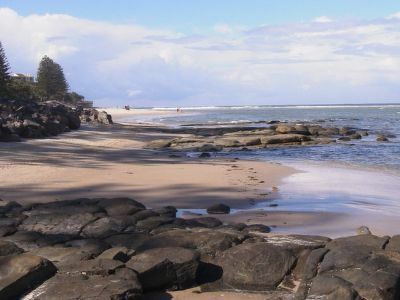 June moved to the SUNSHINE COAST where we were welcomed to longlasting beaches and a clear turquoise sea. At night the sky lit up as the sun went down on the horizon, turning the beach into a magical spectacular array of colour. As we continued NORTH to MAROOCHYDORE we noticed STEVE IRWIN was still busy wrestling with the CROCODILES. Monday 14th. June having stopped at TORQUAY we continued our journey to COOGOON where a welcome local supplied an accommodation with all amenities. 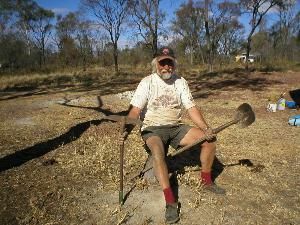 As we reached DEEP CREEK well known for its discovery of GOLD in 1897 which gave survival to GYMPIE, IT WAS MY TURN TO SEE IF ANY WAS MISSED. THURSDAY 17TH.JUNE having called at WOODGATE to see kangaroos running amok on a housing estate we moved onto BUNDABERG where THE FAMOUS BUNDY RUM IS MADE - think we will stop here until the end of JUNE or so, where we have been made very welcome as guests of LORRAINE AND HIENZ where the good times never stop.Seen here serving a festival of food. LORRAINE AND HIENZ RELAXING BEFORE PREPAIRING A TRIP INTO THE OUTBACK. THE RURAL WINSFIELD FIRE ENGINE IS A MOST USEFUL ASSETT FOR FIGHTING FIRES SEE BELOW. THE FIRE WAS SPREAD OVER A CONSIDERABLE DISTANCE BUT WAS CONTROLLED. 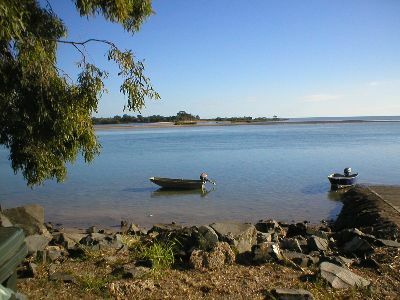 BAFFLE CREEK AT BUNDABURG IS A SERIES OF CHANNELS FED FROM THE SEA THAT CONTAINS A FINE FISHING HAVEN. READY PARKED ON THE BEACH AT BAFFLE CREEK IS A TINNIE A FLAT BOTTOMED BOAT WITH A SMALL OUTBOARD MOTOR WHICH CAN RIDE ON 50MM OF WATER. THE TINNIE ENABLES US TO REACH THE BOAT TO TAKE US FISHING. LAST LOOK AT BAFFLE CREEK BEFORE LEAVING AND HEADING NORTH. CALLED IN AT ANGUS WATER AND THEN MOVED ON TO THE TOWN OF 1770. 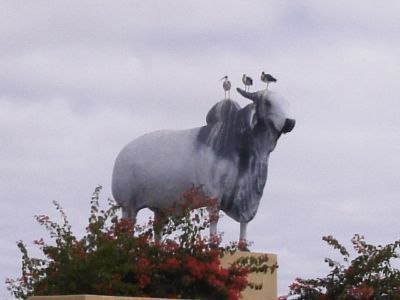 THURSDAY 1ST JULY MOVED ON TO ROCKHAMPTON THE TOWN OF FAMOUS BULLS. 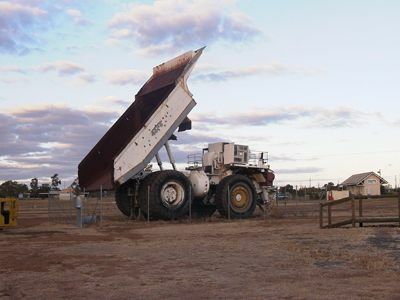 THIS GIANT DUMPER IS BIGGER THAN ANY I HAVE EVER SEEN AT COMET. 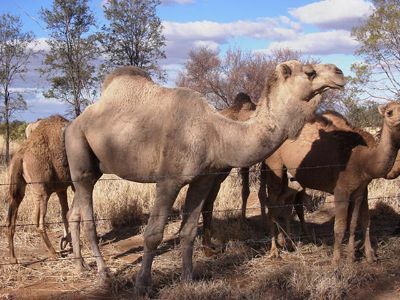 CAME ACROSS A HERD OF CAMELS AN UNUSUAL SIGHT IN AUSTRALIA. AFTER PASSING THROUGH THE TOWN OF EMERALD WE STOPPED AT SAPHIRE WHERE THIS MONUMENT WAS BUILT IN REMEMBERANCE OF PEACE AFTER THE WAR. WE SET ABOUT IN ERNEST SEARCHING AND WASHING EVERY BIT OF GRAVEL TO FIND SAPHIRES. DENNIS EVEN THOUGH DOING A FINE JOB COULD NOT STAND ALL THE FLYS. 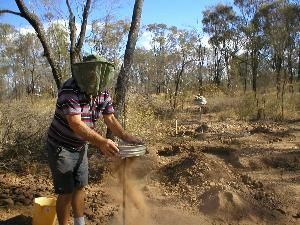 DIGGING FOR SAPHIRES IS HARD DIRTY WORK. 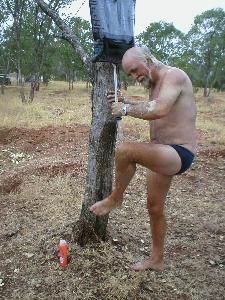 SO A GOOD BUSH SHOWER IS JUST WHAT A DIRTY BOY NEEDS ESPECIALLY ON A HOT DAY. 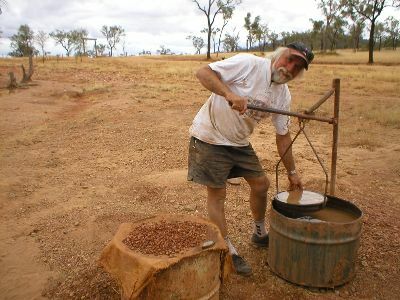 HAVING RETURNED TO EMERALD TO RESTOCK OUR SUPPLIES WE WILL NOW MOVE FURTHER NORTH TO TRY OUR LUCK AT FINDING GOLD. 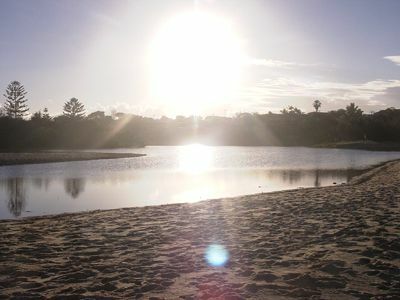 EVEN IN JUNE IT IS STILL WINTER IN BAFFLE CREEK, BUT THE DAYS ARE HOT, WITH BRILLIANT SUNSHINE AND INVITING SEA'S, WHILST THE NIGHTS ARE COLD AND NEEDS WHISKY TO WARM THE COCKLES. NEW ZEALAND Please scroll page. FLY FROM MELBOURNE TO AUCKLAND THE NORTH ISLAND. RETURN TO CHRISTCHURCH AND FLY BACK TO MELBOURNE. TOTAL MILES OVER LAND WITHOUT EXCURSIONS 2,270 MILES APPROX.